Airvoice Wireless GSM, much like the company’s TDMA program, offers users an affordable plan with great calling features and a simple flat rate of $0.14/min on all Domestic calls within the Airvoice calling Network. Plus, subscribers enjoy a host of standard calling features like Voicemail, Call Waiting, Call Forwarding, and Three Way Calling. Customers on the $35.00 or $40.00 plans must call Airvoice at 888-944-2355 to activate a cash card. 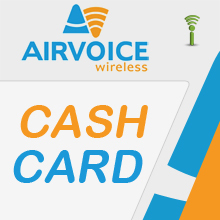 * The Airvoice Wireless Cash Card will never expire as long as the account status remains active. The expiration date will extend as long as the the Monthly Talk & Text doesn't expire. This add-on Cash Card will only expire if the Monthly Talk & Text plan is allowed to expire. **If this is your first time purchasing using MMS or data/web YOU MUST call AirVoice customer service at 1-888-944-2355 to properly activate the MMS/Data functions on your phone. You will not be able to use your phone until you call them first. **BLACKBERRY PHONES AND I-PHONES ARE NOT COMPATIBLE WITH MMS OR DATA. Or, you can also call 611 from your mobile phone or 1-888-944-2355 from a landline for assistance on loading your minutes.